Kinston, NC Bojangles'® Tands, INC. Store #14 - Bojangles'® / Tands, Inc. Whether you’re grabbing breakfast on your way to work or treating the family by eating out for dinner—any time of the day is Bo Time! Bojangles’® menu has options to curb your hunger all day long, including breakfast biscuit sandwiches, uniquely tasty sides and our famous fried chicken. 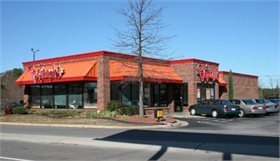 Our Kinston, NC Bojangles’® location at 3007 N Heritage Street is just across the street from Lenoir Memorial Hospital, and we consider it an honor to be able to serve the hospital patients and their families. Also close by is Kinston High School, and our restaurant is always buzzing with Vikings fans!